Being a journalist in Pakistan, I frequently come across crimes committed, sentences pronounced, culprits getting caught, and in many cases, culprits getting away. Thought I may not be physically present every time, I rely on certain ‘sources’ within the respective setup to bring forth the facts, if not the whole truth. On July 30th, I was contacted by one of my sources within the Federal Investigation Agency (FIA) who informed me about a poor soul and a ring of criminals caught at the airport. I asked for adequate information on the issue, and in response, I was not only given access to the evidence but was also allowed to meet the culprits. After going through the documents and meeting the offenders, I thought of relaying the story as it happened. Thirty-two-year-old Muhammad Ramzan was on the front seat of a private taxi heading to the airport, whereas 20-year-old Zia Ali and 35-year-old Adnan Akhtar were sitting in the back. They were busy having a conversation on how to tackle any questions asked by the FIA, with Ramzan and Akhtar strictly cautioning Ali to stay quiet if arrested, and to not mention a word about a liver transplant. These three ‘gentlemen’ were ready to board flight PK-852 from Islamabad to Beijing on July 29th. They hesitantly entered the departures compound and joined the queue. Next to the boarding counter, two officers of the FIA were on duty inside a surveillance room encircled with black tinted glass; ensuring they could see everyone but no one could see them. They swiftly suspected the three and came out of the room to investigate the matter. Normally, the procedure is to check the passport and ticket, but the officers started scrutinising the three. As expected, the young, poor and illiterate Ali got confused and promptly burst into tears. The three were then taken inside the investigation room, where their questioning began. 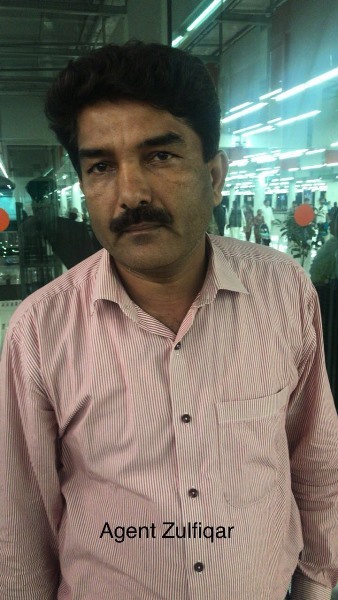 Initially, Ramzan and Akhtar maintained that Akhtar – an officer at the Pakistan Atomic Energy Commission (PAEC) – desperately needed a liver transplant, and that Ali was his first cousin who had agreed to the transplant for familial reasons. 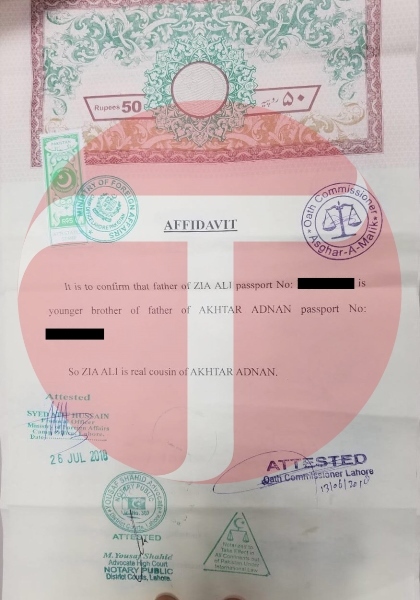 They even had the required papers to prove the relationship, as well as No Objection Certificates (NOC) from Ali’s parents. For the officers, however, this was not enough justification at all. Sensing a crime, the officers continued cross-questioning and took Ali to a different room to grill him further in hopes that he’ll spill the real and whole story. With a fearful voice and teary eyes, the truth started oozing out of Ali’s mouth. He agreed to tell all, only if the authorities saved him from Zulfiqar, the agent who threatened to kill him in case of disclosure. Ali told the FIA that he belongs to a very poor family, with an ailing father who works as a mochi (cobbler). He has three unmarried older sisters, and was in desperate need for money to make dowry arrangements. After years of failing to find a job, he came to know about Zulfiqar – an agent who arranged poor organ donors for rich patients – through one of his friends and agreed to endanger his own life for a price of Rs200,000, which would have been enough to cover a modest dowry for his three sisters. Questioning Akhtar further revealed a new twist, exposing Dr Saleh, who works for a private hospital in Islamabad. Saleh advised Akhtar to get a liver transplant urgently, and referred him to Dr Waqas, who resides and has an illegal practice in China. When Akhtar contacted Dr Waqas, he was told to contact Zulfiqar for arrangements. This is the same Zulfiqar who brokered humans for organ transplants and also arranged visas through fake documents. 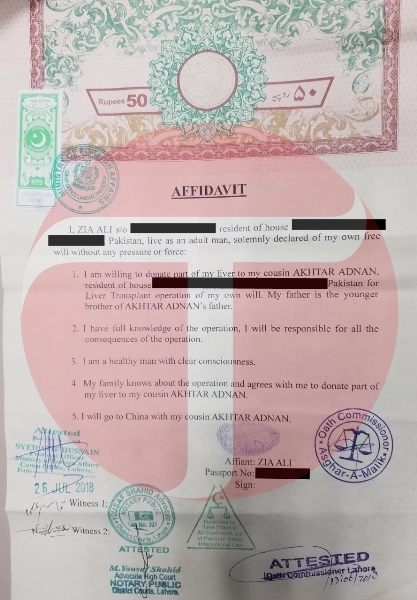 Not only did he arrange for the visa and documents, but he also used his deep-rooted influence in the public administration sector to forge the required affidavits declaring the donor and the patient to be blood relatives. 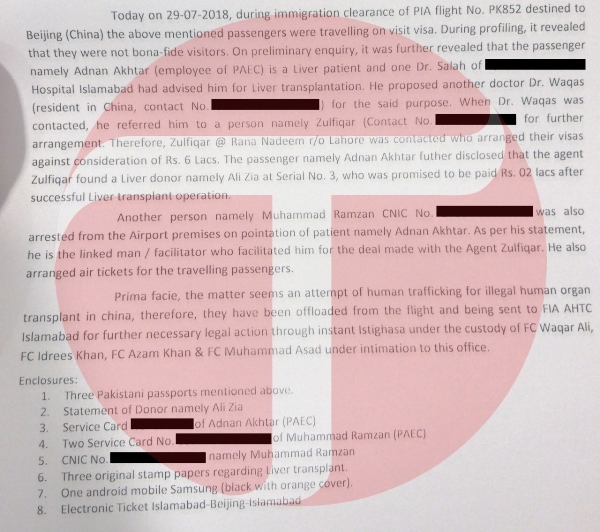 In this particular incident, the FIA team stopped human trafficking and illegal human organ transplantation of a Pakistani in China, but I am sure this was not the first time this network of beasts operated, and nor will it be the last. There are many rich Akhtars who pay such networks out of desperation to buy the bodies of countless poor Alis in Pakistan, willing to sell themselves for their beloved kin. Currently, Ali is in FIA’s custody, which is where his family came to meet him. To my shock, he did not tell his family about the steps he was taking to solve their financial problems. Instead, he told them that he was going to Hong Kong via China. Akhtar, on the other hand, has been transferred to a hospital, where he is on a ventilator and remains in a serious condition. Ramzan, a close aide of Zulfiqar, is still being investigated to unearth the network that runs this scam. Ramzan later admitted that after the liver operation, Ali was to be used for drug trafficking from China to Hong Kong. Furthermore, based on his information, the FIA raided multiple locations in Lahore to catch the infamous Zulfiqar, but it was in vain. He is on the run, but a source in the FIA has confirmed he will be caught soon. Dr Waqas is still out of reach, with his contact numbers in China being deactivated. Meanwhile, the Islamabad-based doctor denies having any knowledge of the ring of doctors illegally operating in China. With the hope that the FIA will dig deep into this mafia, I would like to draw the attention of our new premier towards the many faces of Pakistan. During the elections, Imran Khan sloganeered that there are two different Pakistan, one for the rich and one for the poor. The wider picture shows not one or two, but many social classes in Pakistan. There is a glorious Pakistan for the rich and privileged like Akhtar, who are ready to buy anything and anyone. And then there is a shameful Pakistan for the helpless like Ali, who are willing to sell themselves to make ends meet. But there is another Pakistan for pimps like Zulfiqar, who are always ready to benefit from illegal trades, even if it involves selling humans. Human trafficking remains a serious issue for Pakistan. For instance, there has been a recent increase in Pakistanis migrating to Europe. However, the year 2017 has proved to be disastrous, as 20 bullet-riddled bodies of youngsters from the Gujrat district were found in Turbat, Balochistan. The victims were heading towards Europe through Iran and Turkey with help of a ring of human traffickers that had traces in Kharian, Tehran and Istanbul. 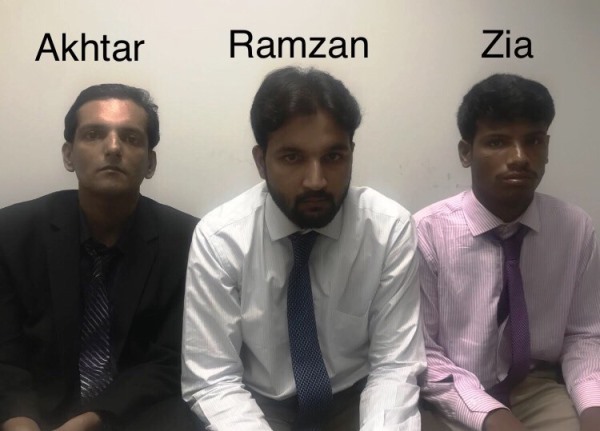 Every year, many Pakistani citizens get caught either illegally crossing into European countries or carrying drugs at the airports of Middle Eastern states. The ones who get caught on Saudi airports eventually get executed by the authorities. 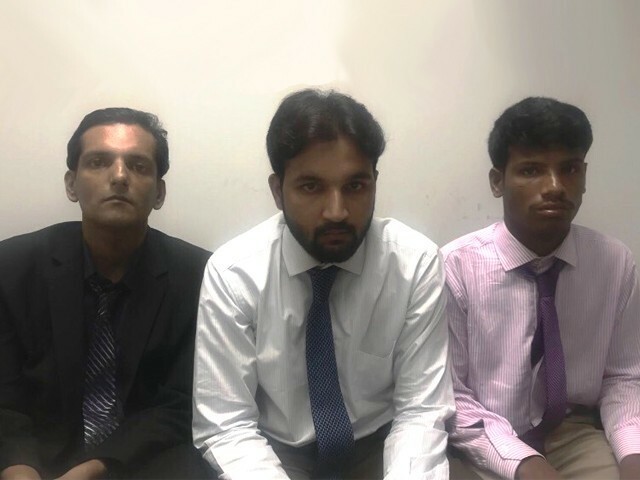 But one must not forget that human traffickers lure and target vulnerable innocent youths on the premise of migrating, but in actuality use them as drug traffickers, all because of ill economic situations and lack of opportunities in Pakistan. The Pakistan for the poor is nothing more than a nightmare, where an ailing mochi has no access to healthcare, his three young daughters cannot be married due to his poverty, and his young son agrees to sell his only valuable asset – his health – to try and find a way out. The gap between the rich and poor has widened to the extent that for the poor, life starts with malnutrition and ends at either malaria or murder. In the midst of his glorious victory, Imran must never forget that he faces the enormous task of breaking these barriers. He must never forget his promise of equality among all citizens of Pakistan. After all, the masses expect that his ‘Naya Pakistan’ will become a place where youths like Zia Ali are not selling their organs in desperation or willing to become a tool for drug traffickers in exchange for cheap migration, and instead will have opportunities to stay and achieve their goals in a Pakistan where the poor get more of a chance to live their life. The earlier thuggish rulers zardari nawaz and their gangs robbed this poor country to the extreme that poor have no food and shelter, they need to sell their organs to survive and these super rich brutal politicians thugs that suppose to be servants of the nation, they, their families and darbaris are enjoying the stolen wealth in abundance in foreign countries and in pakistan. this is not the country our Qaid azam dream for. If liver transplant facility had been available in Pakistan akhtar wouldn’t have to contact these mafia. And its not about being ” rich and privileged like Akhtar, who are ready to buy anything and anyone” its about last effort of a dying man who is now on a ventilater. Hundreds of people die every year because of no liver donor and no liver transplant facility in Pakistan. Liver donation doesn’t cause problem to the donor as the liver regenerates and donor remains perfectly healthy. Do you have any idea that mortality of a liver donor is many times higher than that for a kidney donor? Please don’t post on topics you know nothing about.